At Bookyourdata.com, we do the footwork for you! When you buy this Argentina mailing list from us, you'll have instant access to the pertinent information of professionals and businesses. You can start spreading the word about your products and services right away! Establish a new customer base in Argentina with the help of our business email lists. We know that a business's information can change in a short period of time, and that's why we verify our email marketing lists each week. We double-check our Argentina email list using both computers and humans to get the job done right. 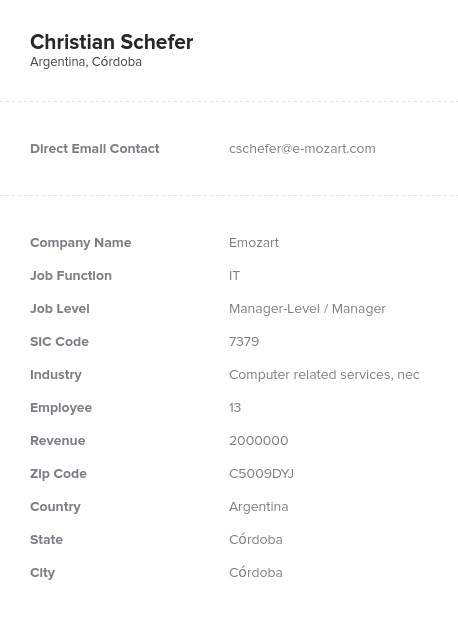 You can rely on the information you download in this Argentina email database! You may have a clear idea of the types of professionals you want to contact in the growing South American country of Argentina. If so, you may opt to make a customized, targeted email list using our list-builder tool. You'll still get plenty of reliable names, email addresses, and phone numbers, but you can choose the job level and function of the individuals on your B2B email list. Furthermore, you can filter your list to include small or large businesses. A customized email address list can simplify the process of establishing business relationships. A second option is buying this ready-made email list for sale. Our pre-built lists give you an abundant amount of helpful contact information. Each of our bulk email lists gives you the data you need to expand your business into South America. Download an email list of Argentine contacts today and start some new business relationships in Argentina!